Show hall is located at the shopping mall (Ideapark, Lempäälä) close to Tampere, Finland. It takes about 1½ hours drive from Helsinki-Vantaa airport, 1h 50mins drive from Tallink/Silja harbour and 1h 45 mins drive from Turku (Åbo) harbour. Link to the Google map is here. Show hall is located about 10 minutes drive from airport. NOTE: There has been some changes on street names and if your navigator is not updated, it may not recognize this street. In that case you may use the old address: ”Valimokuja”. ShowHau Center is located in the same building as Hobby Hall, Tokmanni and Nunnauuni. Entrance door is between Tokmanni and Nunnauuni. Entry closing date is Monday March 4, 2019 at 18.00 at Finnish time or as soon as 180 cats are entered, whichever is sooner. No cancellations allowed – if you enter the cat must be paid. It is possible to change or update cats information till entry closing date. Cat Fanciers of Finland is not responsible for misdirected or lost entries. It is the exhibitor’s responsibility to ensure receipt of entry by the Entry Clerk prior to the closing of the show. Entry Clerk will confirm your entry in 3 days, if you don’t hear anything about Entry Clerk, please, contact Entry Clerk. Please, enter your cat in time to avoid any problems. Fees are inluding all payments. First Entry also includes catalog. Remember that according the CFA Show Rules, every entered cat must be paid within 10 days of confirmation or before the show. * NOTE about double cage space and grooming space : Only a limited number of double cage and grooming space available. First reservation will receive space. ** NOTE about Payment at the door: Exhibitors who are from countries where Euro is not used as a local currency (eg Sweden, Norway, Switzerland, Russia, UK, USA) may pay their entry fees at check in at show hall on Saturday morning without any additional fees. Sorry – PayPal payments are not accepted. Check in on Saturday 8.30-9.30, Sunday 8.30-9.00. Please do not leave the show hall until the advertised closing hours. No cat may leave the show hall before advertised closing time without permission from the Show Manager. There are no specific show hotel this time! Lots of pet friendly hotels in the airport area. All airport hotels are located within 5-10 minutes radius from the airport and many hotels offer free shuttle bus between airport and hotel. Show hall is close to airport hotels and no need for rental car because taxi will be cheaper way to travel between hotel and hall. If you book your room from www.booking.com or www.hotels.com use HELSINKI-VANTAA AIRPORT as location. Catalog is black and white, size A4. Catalog advertisement are due in advance. See the detailed payment information under Entry fees-section. You may pay your add at the same time as entry. This is a non-vetted show, but vaccinations will be checked at check in, so bring your vaccination records with you. No kittens under 4 months of age will be allowed in the show hall. Proof of age must be presented upon the request of the show manager. It is strongly advised that all cats or kittens entered or present in the show hall are inoculated before entry by a licensed veterinarian against feline panleukopenia (formely known as feline distempter or feline infectious enteritis), feline rhinotracheitis, calici viruses and rabies. It is strongly recommended that cats and kittens be tested and found negative for FeLV before entry. All claws of all entries must be clipped prior to benching. Under current CFA show rules, show management reserves the right to have any cat showing signs of illness, disease or parasites removed from the show hall, in order to protect other cats in the show. All claws must be clipped prior to benching. De-clawed cats are not eligible for entry. All household pet entries over 8 months of age must be spayed or neutered. Please note that according the Finnish animal protection law, cat must have litter box and water bowl all the time in cage. Official inspection veterinar might be doing checkings and veterinarian has the right to remove the cat from the show hall if law is not followed. Finland is having the same importing regulations as rest of the Europe. Check current importing regulations from Finnish Food Safety Authority Evira: http://www.evira.fi/portal/en/ (Animals -> Import and Export). It is owners responsebility to check all importing regulations and keep cats recoreds updated. Club is only offering a table space and you bring your own cage. You cage must fit 65cm x 65cm space, otherwise you need to pay double cage space fee. No more than one cat or two kittens may be benched in a single cage. If you need club provided cage, you need to pay extra about cage. Cage will be (HWD) 65cm x 65cm x 50cm. We are sorry but if you have club provided cage, we may not be able to honour your benching request. Club wants to help enviroment. There is litter available at the show hall but if you take the litter at show hall, you need to take it with you to home. It is not allowed to put cat litter in trash bins. We would recommend that you bring your own litter and take the litter back home and reuse it. This way we all support enviroment! There is cafeterian at show hall. Contact Show Manager Tuija Aaltonen ( tuija.aaltonen@cfasuomi.org ). Exhibitors who need VISA to enter Finland, please, contact Show Secretary Pauli Huhtaniemi ( pauli.huhtaniemi@cfasuomi.org ) for invitation. 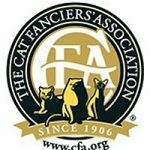 All entries in Championship (except Novice), Premiership (except Novice), Agility (if offered), Kittens, recorded Household Pets, and registered cats competing as Household Pets with an Household Pet color class prefix will be scored for CFA awards.